Following in the footsteps of the 2017 remake of Superstar Saga, Nintendo has once again repackaged a Mario & Luigi RPG for the 3DS and added a minion-focused side mode. 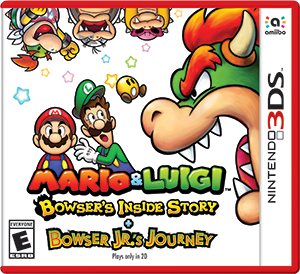 Mario & Luigi: Bowser's Inside Story + Bowser Jr.'s Journey, aside from being a mouthful of a title, brings players back to the third entry in the Mario & Luigi RPG series, which includes the return of fan-favorite oddball villain Fawful as he plots to dispose of both the plumber brothers and King Koopa in one fell swoop. Although the changes and additions to this version may not be particularly elaborate, the original game is still an unmissable RPG adventure. Mario and Luigi are summoned to Peach's Castle to address an unusual epidemic sweeping the Mushroom Kingdom: a disease called The Blorbs which is causing Toads to swell to enormous sizes. Bowser, naturally, bumbles his way into the meeting as well, but the Koopa King is soon tricked into inhaling Mario, Luigi, Princess Peach, and a score of Toads when the true villain reveals himself. Just like in Superstar Saga, Fawful's unusual speech patterns and eccentric behavior steals the show. Fawful is undoubtedly one of the best things to come out of the Mario & Luigi RPG series, especially because Nintendo has done a great job of making him bizarre and interesting without getting too tiresome—that might explain why this is his last appearance, but maybe one day we can look forward to the return of his chortles and fury. Regardless, Bowser's Inside Story is rife with fun, childish humor (in a good way), not only with Fawful but with just about everything Bowser does. The game simply doesn't take itself too seriously and enjoys its own absurdity, and it's hard not to fall for the game's charms. The gist of the gameplay should be familiar to Mario & Luigi fans by now, but as a quick refresher this is a turn-based RPG with active battles, meaning that well-timed button presses will yield more damage or help defend against enemy attacks. In Bowser's Inside Story you control not only Mario and Luigi but Bowser as well—while Mario and Luigi search for Peach and an exit from Bowser's body (thankfully not the usual exit), Bowser stomps through the Mushroom Kingdom. 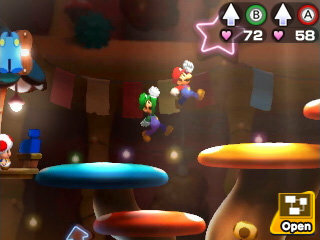 The developers have done a pretty flawless job of balancing the two halves of the adventure, with Mario and Luigi on one hand and Bowser on the other. They generally all fight in the same way, even if Bowser trades jumps and hammers for punches and fireballs, but they're still distinct enough that the Koopa King's raw strength is evident. As engaging as Mario and Luigi's battles are there's something satisfying about mowing down enemies as Bowser. Occasionally the plumbers and Bowser even need to work together to overcome an obstacle, and you can switch between the two parties with just a press of a button. It's a fun mechanic though it's a shame that generally you only do so as part of the story's progression, as it would be even more interesting to work out which character is best suited for an area on your own. At least by the end of the adventure there's more room for free exploration, though it's mostly for picking up collectibles as Mario and Luigi. 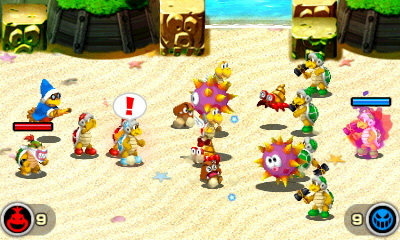 Bowser's Inside Story is also awash with mini-games—at times they're in danger of overstaying their welcome, in fact. Some can be a nice break from the main adventure of exploration and battling but others get to be a bit much. Thankfully they're never quite overused, but the best use of mini-game mechanics remains the special attacks used in battle, not the story-required mini-games to power up Bowser. Overall this 3DS remake sticks to the original game's features quite closely. There are a lot of small changes but for the most part these will be hard to spot if you haven't played the game since its release, and many are only noticeable when held up side-by-side. On one hand, the original game is fantastic as is and doesn't need any significant touch ups. On the other hand though, it would've been nice to have more unique features aside from Bowser Jr.'s Journey, which is a rehash of the minion mode from the Superstar Saga remake. This time it's Bowser Jr. taking control of a minion army in real-time strategy battles, heavily based around a rock-paper-scissors mechanic of minion types. Once you select which minions to bring into battle you mostly sit back and watch the battle play out, with only minimal involvement by using Captain Commands or timed attacks. This side mode is once again a lackluster addition, one that simply doesn't have the same immediate charm and appeal as the main adventure and relies too much on slow, tiresome battle mechanics which only get worse once you need to grind to build up your level. Bowser Jr.'s Journey is simply a dull adventure that drags on too long. The controls in Bowser's Inside Story may seem simple at first since it's a turn-based RPG, but the timed button presses to deal extra damage make things a little more complicated. Thankfully it's an easy skill to master, and even the more elaborate commands for special attacks aren't too hard with a little practice—you can even select an easy mode if you're having trouble with them. This version also eliminates the need to use the microphone during Bowser's giant battles which is definitely an improvement. One odd feature though is the lack of a left-handed mode during these giant battles, which require holding the 3DS sideways. It's a minor inconvenience but in the end it's still an inconvenience, one that easily could have been avoided, so it's strange that the option isn't even there. The most noticeable addition to this 3DS version of Bowser's Inside Journey is the visual overhaul, trading pixely sprites for a more modern 3D visual style. The game looks great though it's a shame to lose the charm of the excellent sprite designs of the original, and it's a little disappointing to bother with the change at all since this version doesn't even take advantage of stereoscopic 3D. Regardless though, the art design of the game is strong enough that there's still a ton of charm and personality in every character and animation. The soundtrack also showcases some great audio design. There may not be too many different locations in the game, but the background music is catchy and fun in each and every one. Bowser's Inside Story may be an RPG but it's not quite the epic length of most Japanese RPGs. Around 20 hours will see you through the game, though there are a few side quests you can tackle and other optional challenges. And of course there's Bowser Jr.'s Journey which is its own time sink as well. Regardless, Bowser's Inside Journey is a decent length and thanks to a solid sense of pacing the adventure never feels bogged down. The original game received high praise from critics (including me) for its charming blend of humor, engaging RPG battles, and high quality presentation on the DS. 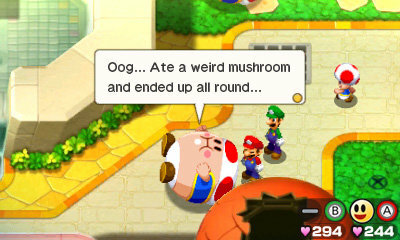 Mario & Luigi: Bowser's Inside Story + Bowser Jr.'s Journey is no different. Though the minions side mode first seen in the Superstar Saga remake still feels lackluster and entirely too repetitive, the overall package here is still a fantastic example of the allure Mario & Luigi RPGs as games that appear simple at first but offer up plenty of depth and addictive gameplay. 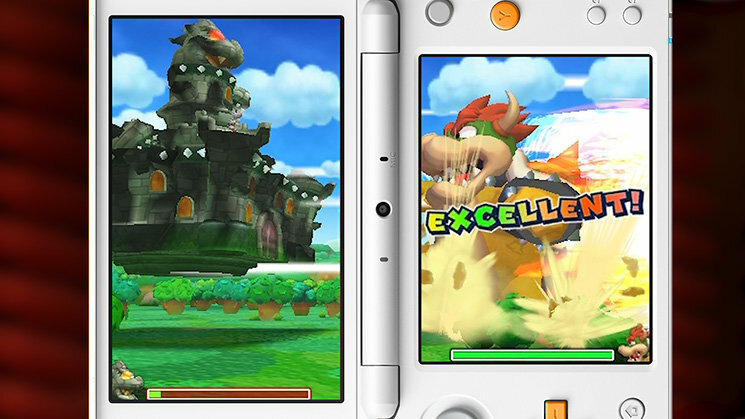 Whether you play the original DS version or this 3DS remake, no one should miss out on this unique Bowser adventure. This actually my fave game of the series. IMO the series just was the same after this game. I appreciate the remake and glad they skipped to this game and not partners in Time. It did seem odd at first that they would skip over Partners in Time, but the return of Fawful is worth the jump in order.